458%: Municipal tax hike this year in Chesterfield in Burlington County, exempt from the 2-percent tax cap because its rate had been less than 10 cents per $100 of assessed property value. Homeowners will see an increase of about $1,000. 8: Winning entries in Deborah Heart and Lung Center’s time capsule competition, in which students were asked to predict what will be obsolete in just 10 years. On June 6, they will bury the capsule filled with board games, landline phones, schoolbooks, fax machines, newspapers, CDs, keyboards and even keys—not to be opened until the hospital’s 100th anniversary in 2022. $100 million: Price tag of the Cooper Cancer Institute, which broke ground in May beside Cooper University Hospital. The expected opening is in 2013. 71: Age of Burlington County College’s oldest graduate—Syed Rizvi—who will now finish a bachelor’s degree in English literature at Rutgers. $192,000+: Funds raised during the Walk Now for Autism Speaks fundraiser held in May in Mount Laurel. $15,000: Prize for J. Harold Van Zant Elementary School in Evesham, which won the national Save, Vote, Win competition hosted by Cherry Hill’s Cartridge World. The money will be used for new technology purchases. 2:1: Margin by which Ocean City residents rejected a May referendum that would have repealed a ban on BYOB establishments. 8th: Place, out of 12 casinos, that Revel placed in its first month of operation in terms of winnings. $13.4 million: Revenue from Revel gamblers during the month of April. 58%: State residents against legalizing Internet gambling, according to a recent Fairleigh Dickinson University PublicMind poll. The same percentage, however, supports sports betting. Mark your calendars for June 21. That’s the day, with a simple click of the mouse, you can help the Ronald McDonald House of Southern New Jersey win a car through Toyota’s 100 Cars for Good program, a major philanthropic initiative in which the automaker is giving away 100 cars over the course of 100 days. The Camden-based organization, which provides a “home-away-from-home” for families whose children are being treated at area hospitals for critical illnesses and traumatic injuries, was selected as a finalist along with hundreds of others nationwide. Each day, five are profiled at 100CarsForGood.com, where visitors can vote for the nonprofit of their choice. Haddonfield native Christian Giudice covers the life and career of one of Nicaragua’s most influential and iconic boxers in his new book, Beloved Warrior: The Rise and Fall of Alexis Arguello. Despite the losses early in his career, including his memorable defeat at the hands of Aaron Pryor, the boxer known as “El Flaco Explosivo” (The Explosive Thin Man) went on to win three world titles and a place in the International Boxing Hall of Fame. Arguello’s fame stretched far beyond the ring; he was a man who cared deeply for the welfare of his people and was actively involved in Nicaraguan politics, becoming mayor of his hometown of Managua several months before his controversial death in 2009, ruled a suicide but speculated as the possible result of foul play within his political office. Giudice, a sports writer who now lives in North Carolina, portrays in his latest book the conviction and compassion of a fighter who became an inspiration to Nicaragua and people around the world. It’s a story that emphasizes the human spirit and how much a man can achieve if he has the will to pursue it. He may only be 8 years old, but some sports fans could learn a thing or two from Andrew Wixted. 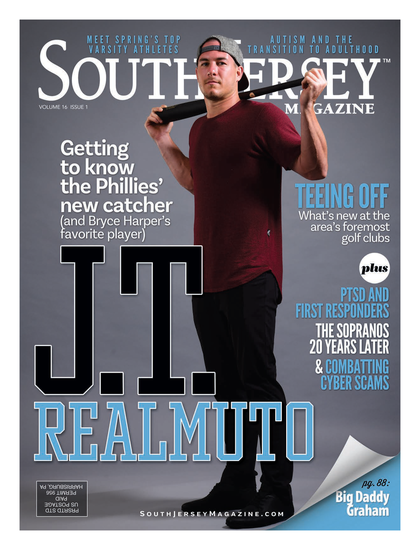 The Marlton boy was at the May 7 home game of the Phillies versus the Mets—one of the most well known rivalries in baseball—and though the Phillies lost the game, that’s not what Andrew and many others will remember. The young boy was handed a ball after the 9th by a ballgirl reaching into the stands, but it wasn’t until he got home and his father, Marty, listened to a replay, that he realized the hit—a game-winner by the Mets’ Jordany Valdespin—was more than an impressive home run; it was Valdespin’s first-ever hit in the big leagues. It was a shame, announcer Tom McCarthy said, that he wouldn’t be able to keep the ball from his first hit. The Wixteds e-mailed the Mets and offered to give the ball back. They didn’t do it expecting anything in return, but a father’s lesson to his son in good sportsmanship resulted in quite a memorable night for the family. The two teams—despite their fierce competition—came together to offer the family tickets for the May 9 game, a signed Valdespin bat, and a meet and greet with players from both teams. Remember the book All I Really Need to Know I Learned in Kindergarten? The main themes were the importance not just of sharing, but of finding the balance between work and play. That work comes to mind with the launch of Camden County’s new Bike Share Program, the result of a donation of more than 225 used bicycles collected by the Division of Environmental Affairs. For a nominal fee, any county resident can borrow a bike—whether for recreational opportunities or for an eco-friendly commute—and then simply drop it off for the next person to enjoy. The program began in late May following the work of volunteers who refurbished the bikes. If interested in sharing your time, repairs will take place Wednesdays and Saturdays at the county’s Health and Executive Campus at Lakeland, where the program is based. Call (856) 858-5241 or email ccbikeshare@camdencounty.com for more information. A Maple Shade police officer was arrested on drunken driving charges after he allegedly crashed his township-owned car into several street signs and a streetlight. The longtime police secretary here, along with her daughter, were arrested after marijuana and approximately 50 Oxycodone pills were found in their home. A 28-year-old was arrested after allegedly driving drunk to the police station to pick up a report about a previous violation. The owners of East Gate Shopping Center have filed a lawsuit challenging the referendum and subsequent ordinance approved that allows liquor licenses at neighboring Moorestown Mall. Several residents woke up one morning in May to see racist graffiti sprayed on cars and buildings throughout the Saddlertown neighborhood, which is historically black and was founded by a runaway slave. A woman tried to enter Washington Township Municipal Court with 19 bags of crack cocaine. She fled when a security officer began to routinely search her purse. A new greenhouse used by the Collingswood middle and high schools is doing more than giving students a green thumb, if you ask Dr. Joanne Plescia: It’s providing a foundation for the future. “We have students coming into sixth grade and, for a subset of those students, they don’t have as many opportunities to participate in extracurricular activities,” says Plescia, the district’s director of special education, adding the idea of a greenhouse came up as a new way to expose them to social and prevocational skills. They refer to themselves as a traveling circus. The rookie lawyer, the graduate, the city chick; all admittedly different personalities who came together with a common goal—to test what their minds and bodies were capable of before entering the workaday world. Fourteen states and 2,178.3 miles later, at the top of Mount Katahdin, Brandon and Kate Imp, siblings from Mount Laurel, along with Kate’s best friend Emily Ginger, of Chicago, accomplished their goal: hiking the Appalachian Trail from Georgia to Maine in a five-month journey of discovery. On June 30, residents can witness the transformation of the trio during the screening of their documentary, Beauty Beneath the Dirt, at Lenape High School at 7 p.m.
A good deal of what they learned revolved around courage, determination, focus and confidence. “Sometimes those traits are buried deep within and it takes a big risk to recover them,” says Brandon, now 24, who is living in San Francisco and preparing to enter medical school in the fall. Visit BeautyBeneathTheDirt.com for more information. Maple Shade’s Tyrah Skye Odoms earned her place in the limelight rather early. The 7-year-old performer will debut on Broadway in the 2012 revival of the classic Annie. Odoms, who has performed in theater groups all across South Jersey, will play the part of the orphan Kate. Virtua recently received $1 million from Marvin Samson, of Moorestown, and his self-named foundation. The money will go toward establishing a centralized medication distribution service to benefit all four of Virtua’s local hospitals. Marlton’s Evans Elementary School has a new hero in 10-year-old Derek Mihalecsko. The fourth-grader recently jumped to the aid of a friend who had choked on his snack during a lunch period one day, performing the Heimlich maneuver to ultimately save his life. Mihalecsko was honored by the Evesham Township School District for his act of bravery. The American College of Emergency Physicians honored Dr. Alfred Sacchetti, of Voorhees. Sacchetti serves as the chief of emergency services and co-chairman of the department of emergency medicine at Our Lady of Lourdes Medical Center in Camden and was selected for the national award based on his outstanding work in his field. Megan Stasi, amateur golfer and former star of the Eastern Regional High School golf team in Voorhees, was one of two amateur golfers selected to play in the 54-hole 2012 ShopRite LPGA Classic early this month at the Stockton Seaview Hotel and Golf Club in Galloway Township. Stasi is currently ranked the No. 3 amateur in the country by Golfweek. Pennsauken High School English teacher Frank Stepnowski was honored at the May 11 Phillies game as one of the top 10 All-Star teachers in the area. Stepnowski was nominated by student Tanisha Crawford, who, along with thousands of other area students, submitted an essay about her teacher, highlighting his all-star qualities. Randi Wall, a native of Berlin Township, has decided to give back to the schools she graduated from as a child. With the help of organizations across the country and donations from helpful volunteers, Wall recently donated more than 1,500 pounds of school supplies to John F. Kennedy Elementary School and Dwight D. Eisenhower Middle School to be split between the two. Robins’ Nest, a Glassboro-based organization aimed at improving the lives of local children and families, awarded Barbara Arnold with the Volunteer of the Year award. She was honored at an appreciation event for their more than 40 volunteers in Haddonfield.